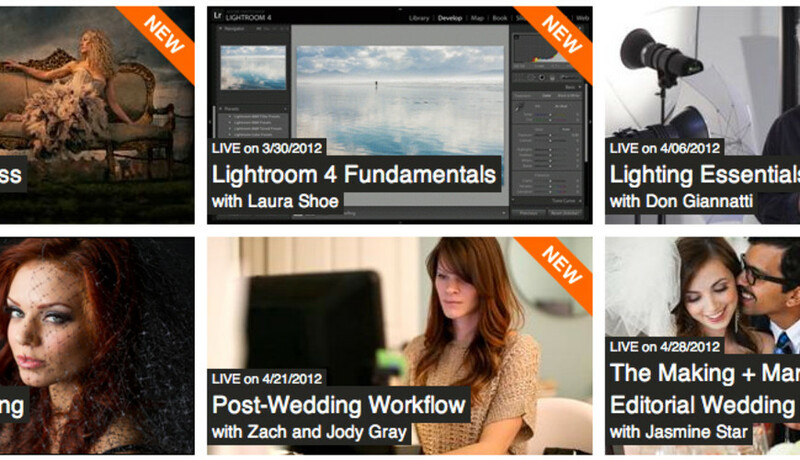 The courses when streamed live are free. The videos of the courses can be purchased for $99 during the course and any back-courses you may have missed for $150. In a stroke of madness, I woke at 2am yesterday morning to prepare for the 3am start of the first day of Bambi Cantrell's "Posing Masterclass" three-day course. And these are full days, from 2am to 10am with only 1 hour and 15 minutes of breaks spread throughout. The format includes presentations and actual live shoots. From yesterday's course I accumulated 7 pages of typed notes from the course. I couldn't bear the idea of waking at 2am for the next two days so I bought all three day's videos for $99 so I can have them to review at my leisure. It's also worth note that on the day of first transmission, the video is re-streamed one hour after it has finished, which means I could have actually watched this from 11am onwards, but I didn't know this at the time and have other things to do with my days this weekend. Turns out the videos are broken down into bite-sized chunks and made available the next day and if you've bought them you can stream or download them in high or low definition. You also get a copy of the slides used during the day. So what are some of seven pages of notes I made on the first day of Bambi's course on Posing? You'll find my top 30...ish below. It started as a top 10, then a top 15, the top 25 and I couldn't stop pulling gems out of the notes I made but I seem to have rounded it out to 35. All a bride is, is a girl in a white dress. If you start thinking like this then you'll be able to photograph anyone, anywhere. There's no skill in taking 1,000 pictures. Get it right in the camera to begin with, we've become sloppy photographers with a machine gun style. When you have a lot of pictures this means you've a lot of editing to do. More time in front of your computer editing photos, means less time in front of your clients taking and selling your images. Spend money on good glass, your photo is only as good as your glass. Use short-run marketing material, you can change it up and keep it varied, changing your message as you go, as required. If you're making slideshows for your clients, purchase royalty free music from a site like Triple Scoop Music. Never use commercial music without a license, you may get sued and you're definitely stealing. You wouldn't want someone to steal your photos. To get your client to buy big, show big. People start to see you as an artist rather than just someone with a camera. When they view you as an artist they think with their heart. When shooting against a wall, have your subject come forward 3 feet to help separate them from the background. Look at backgrounds as something neutral. Notice shapes, donâ€™t think about what the background actually is. Bounce light off walls to create big light sources. Use your lights to modify the natural light, you can shoot in full daylight and look like itâ€™s late afternoon. Posing is sometimes more about moving you than the subject. Remember, the meter in your camera knows only one thing, 18% grey. If you only listen to the meter, you need to compensate for light coloured and dark coloured subjects. Have the light skimming across the subject to bring out definition and shape the body. When sitting, have people sit on their thighs, as in just on the edge of the seat, or rolled onto their thigh. It brings the weight there and pulls their posture into shape. Never have weight evenly distributed, it most often looks unflattering. When standing have the weight shifted to the back leg to remove bulk from the front leg. If there's something unflattering about the subject, hide it, if it's not in the photo, it doesn't exist. Practice in your mind. Every time you walk into a building, think, where is the shot, where is the right location, how does the light fall in here. When in a line at the bank look at the people around you, consider how the light falls on their faces. Never, never, ever let a client see your unedited work and never let them see you edit the work. You don't want them thinking a good photo is all about photoshop magic. And remember "you can't polish a turd". Never ask permission to do your job. Do what you need to do until someone asks you to stop. In contradiction to 20. Always ask permission before you touch your subject. If you need them to move into place use the back of your hand to indicate where they should move to. It's too confronting if you use an open palm and expect them to come to that point. Make the experience fun. A bad experience means your client won't return and won't tell their friends about you. General rule, hide the hands in a close up portrait or use them side on. A full hand is about the same size as the subject's face and will compete for attention. Look for and create triangular shapes in your group compositions. Don't sit larger girls for shoots and don't shoot them straight on. As often as possible, use natural lighting for shoots with kids. It's less scary for them than bright lights flashing in their face. Instead of having people come to your home, go to theirs, they are more comfortable in their environment. Spread your groups out, donâ€™t be afraid of giving them a little more room. Clamshell lighting is beautiful. Single light above at 45Â° and a reflector below. Shoot portraits in Landscape mode so when put in an album they arenâ€™t cutting the flow of the book. Remember people's names and use them often. It makes them feel familiar and more important. When talking photos of a subject, adults are no different to children. Study other photographers work. What makes a good picture good. Look at the classics. Worst thing is the parents who are over attentive and donâ€™t want their kids to be kids. If you have an â€œUncle Bobâ€ taking photos, let him go, as long as heâ€™s not in your shot. Itâ€™s an insult to family-hood when you try and stifle these people from taking â€œyourâ€ set-ups. You donâ€™t want him in your face but you do want to shoot every wedding and event for these people. So let them do it, itâ€™s worth more than the bad publicity of being an aggressive photographer. It was hard to bring this down to a list of just 35. There was so much information in just the first day of the course. Bambi has a great presenting style and her live shoots were a great example of how she interacts with her subjects, though she does appear a little wild at times, it is her nature and it works for her. I guess another tip is don't present yourself in an unreal manner, be yourself and be true to your nature. I thoroughly recommend the courses and I will be tuning into future courses. *please note when you first visit the site the times are based on US Pacific time. When you sign up it converts them to your local time-zone for you.